Here at The Infatuation, we cover a lot of ground. Yes, we're probably going to review the new French place that some guy who isn't French just opened, just like everyone else that writes about restaurants will. But we also do our best to shine a light on some of the other really good establishments around town that don’t have PR teams pimping them out at every opportunity. Not every restaurant needs a press release. Spicy Village is squarely in the latter category. 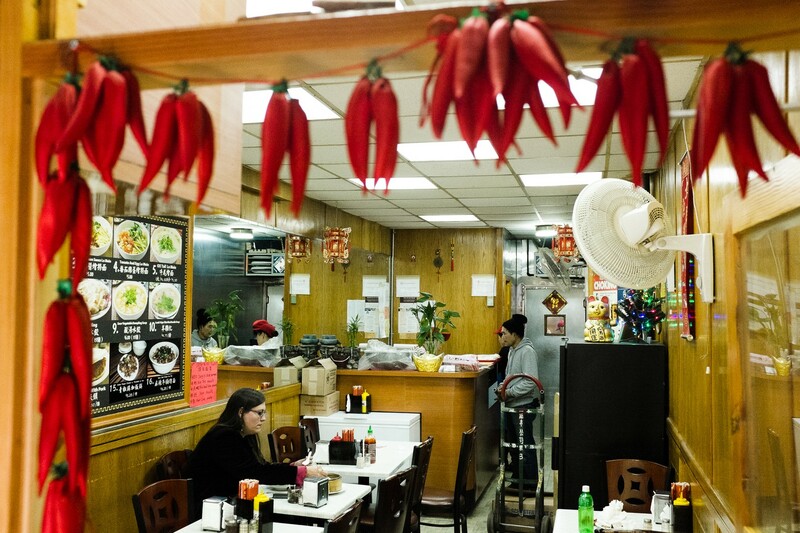 Even though the New York food royalty is up on this restaurant (none other than Danny Bowien of Mission Chinese has admitted to borrowing recipes), we can promise you that they don’t have a PR team here. And we certainly wouldn’t recommend that they hire one. As a matter of fact, if they're going to spend money on anything, the first thing they should invest in is a dimmer switch for those fluorescent lights. Or maybe some plastic plates and cups, instead of styrofoam. In other words, this is not a place you want to take a date. Spicy Village is a restaurant for you and a few friends (they can’t accommodate parties larger than six) to eat some cheap, delicious Chinese food. And when we say cheap, we mean cheap - on our last trip here our group of five got stuffed for $10 per person, including tip. And you can catch a buzz for virtually nothing, since it’s also BYOB. A few of the dishes are forgettable, but there are enough gems on this menu for us to recommend it wholeheartedly if you have a couple of adventurous friends to join you. Just bring some cash and a six pack, order a few dishes to share, and you’ll go home happy. The first item on their specials list, and probably the best dish here. And there’s not much to say about it that the name doesn’t cover. It’s a big tray of chicken covered in a chili-oil sauce and some cilantro to cut through the heat. You can add noodles for an extra buck, and you're going to want to do that. These obviously aren’t pancakes in the American breakfast-food sense of the word. They’re better. They’re fluffy little circles of heaven with a crispy crust. You can have them filled with pork (our favorite), beef, or egg. Or you can order them plain and dunk them into the various leftover sauces from the other things you've ordered. Any or all of these options should be pursued. Chicken and peppers grilled in a spicy sauce served over rice or noodles. It is awesome. It's a little bit hot and a little bit sweet and extremely excellent. These don’t compete with Joe’s, but they’re pretty solid. Piping hot and full of broth and delicious pork, they do their job, especially for the price. All of the noodle dishes are pretty similar - thick hand-pulled noodles, various greens, usually bok choi and cilantro, and meat. The spicy lamb is good, but the aforementioned big tray chicken is really the way to go.